This week I have an easy and delicious twist on chicken enchiladas. I’ve been eating these for as long as I can remember and they’ve never disappointed. 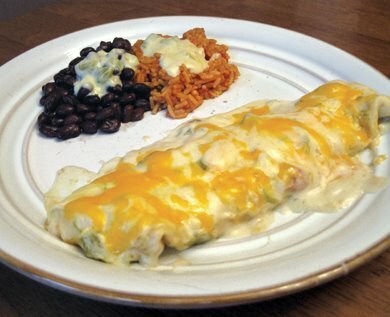 This recipe makes four average sized enchiladas though the sauce can go farther. Simply increase the amount of chicken and tortillas to make more. You will find a link to a printable recipe card at the end of this post. In a large bowl, mix the chicken soup, sour cream and green chilies until well blended. Heat the sauce in the microwave for one minute. This step is not necessary though cuts down on baking time a bit. Cut thawed chicken into bite sized pieces and cook in a skillet until done. As I’ve mentioned before, I always cook with chicken tenderloins. We buy them in large bags and thaw them as needed. I use one tenderloin per enchilada though you can adjust this to suit your preference. Season the chicken while cooking with a few shakes each of onion powder, garlic powder, black and red pepper and cilantro, or the seasonings of your choice. Lay a tortilla on a flat surface and spread a little sauce down the center. You can also add some chopped jalapenos if desired. Next add the chicken. Top with shredded cheese, as much as you like. I use cheddar and sometimes also a little pepper jack. Begin rolling the tortilla tightly, one side at a time. Roll the other side and lay them in a greased 13 x 9 baking dish. I use toothpicks to keep them closed while cooking. This also helps me indicate which have the jalapenos in them, because mine does not! As I mentioned, this recipe will make 4 average sized enchiladas. I only make three as you see above – two large ones for the man and one average size for me. A 13 x 9 pan will hold 4 side by side. Pour the remaining sauce over the enchiladas and spread evenly. Bake at 375° for about 15 minutes or until sauce begins to bubble a bit. Remove from oven and add some shredded cheese on top, return to oven and cook for an additional 5 minutes. I recommend an oversized spatula for removing them from the pan, as they are kind of floppy! Letting them sit for about 5 – 10 minutes after cooking also makes serving easier. I like to serve them with spanish rice and black beans with a little sauce poured over the top – delicious! If you make any of the recipes I post here, I’d love to hear about it! yeah, I should have posted my navy bean soup recipe using the easter ham bone! Thanks for this~it’ll be tonight’s dinner! Sounds yummy! sounds wonderful, i really love visiting your blog you have so many great ideas! I made this for dinner last night and it was so yummy! My fiance and I like a little more ‘heat’ to our foods, so, instead of the jalapenos, after we sat down we just added little drops of Sriracha all across the top. No joke – he talked about how good it was all night. Thanks for the recipe! You are posting up a storm, lady! This looks utterly delicious and has my tummy rumbling!